Made with fresh spring water, it has a clean, delicate malt flavour. An ideal partner for spicier foods, fish, Mediterranean dishes, BBQs – or simply enjoy on its own, ice cold. Barnaby’s Brewhouse is based on the Riverford dairy farm in South Devon. The team are passionate about producing outstanding craft beers as sustainably as possible. They use organic malt and hops sourced in the UK, and water from a natural spring in the middle of our own organic farmland. Their bespoke brewhouse was built using innovatively adapted, reclaimed equipment. 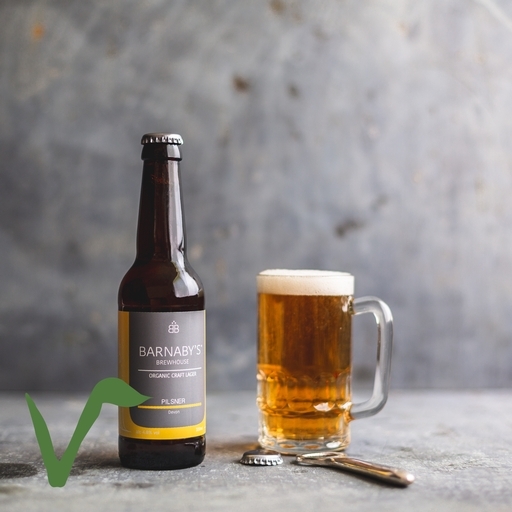 Barnaby’s don’t use any animal products to fine their beers, as they are conditioned over time and then cold filtered. The result is excellent lagers that everyone can enjoy. Store in a cool, dry place and serve chilled.